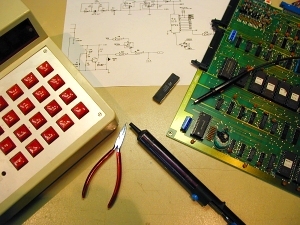 Anyone can sell Boards - however only few offer good service for PCBs and Cabinets. We are addicted to Arcade Video games since 1981, and since that time we have repaired, converted and installed innumerable Game Boards. We have developed test equipment and manufactured some electronic accessories. If it concerns your arcade collection, you are in good hands here. 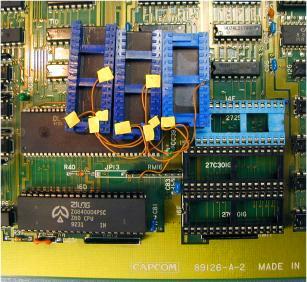 We repair your Video Game Boards at a fair price. The Boards must be connectable to normal test equipment, e.g, not use High Resolution Monitors such as Virtual Fighter, etc. In addition, we reject repairs where you can clearly see that some other Expert already tried their luck. Normally, such 'repairs' will cause more problems than they fix, and successive repairs are much more difficult and therefore usually uneconomic. A frequently asked question is a cost estimate. Although this is understandable, it is unfortunately very hard to do, because the most expensive thing is to find the problem or defective part, so the cost estimate would be nearly as expensive as the repair itself. We charge a 32,00 € handling fee per board, independently of success or expenditure. This charge will be credited against the actual repair costs. We repair on success basis, so if we cannot repair your PCB or no failure shows up then you only have to pay the handling fees and the freight charges. At the moment we charge 63,00 € per hour spent on your work, billed in 15-minute increments. In order to keep costs down, please advise a maximum limit, up to which we should try to fix the board. Without a given limit, we break off troubleshooting after 2 hours. Please do not send us your Boards without contacting us first, either by E-Mail or by phone and don't forget to enclose a failure descripton and your return shipping address. Since the beginning, Video Game board manufacturers were in a constant race against bootleggers that could copy even complicated multi-layer boards with dozens of custom chips. By the End of the 80's, some manufacturers had the idea to equip their PCBs with battery-backed RAM in which parts of the program were stored. That did not stop the bootleggers for very long, but it presented big problems for honest buyers: if the battery died after 4-5 years, then the PCB was dead. Returning it to the manufacturer was usually too expensive or difficult, so most of the expensive toys went into the dustbin. Please contact us before you send your Boards, and don't forget to enclose your return shipping address. Unfortunately, the standarized JAMMA connector was first introduced in 1987, so many popular Games like Pac-Man, Galaga or Crazy Kong need and adaptor in order to work in a standard JAMMA cabinet. 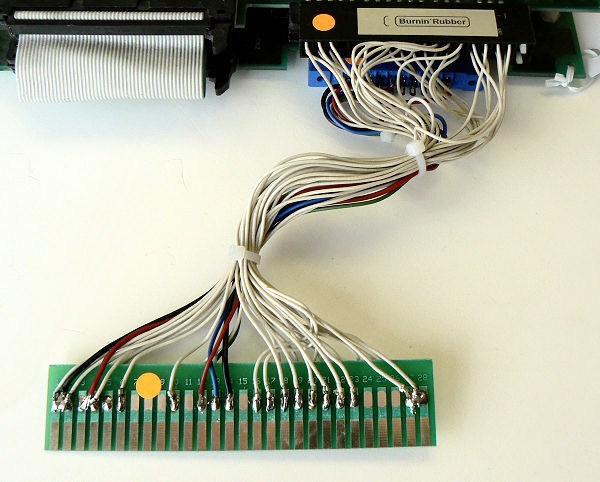 The adapter consists of a fingerboard (see the picture) with 28 pins, that fits into the Jamma connector of the Cabinet, a PCB-Edge Connector, usually 18 or 22 pin, and the wiring harness, which connects both. With a little skill and the necessary parts, you can solder it yourself, or just order it ready-to-go with your Board 59,00 € per adapter. After many years of service in smokie clubs, Arcades or Fish & Chip Shops most Game Boards are covered with a thick layer of dust, fat, Cola and/or other deposits. Naturally, that is no condition for collectors, therefore we developed and offer a unique cleaning service, with which the PC-Boards are carefully washed in a special bath and dried afterwards. After the treatment the Boards are absolute clean and look like as if they would have come fresh from the factory. Apart from the aesthetic component the bath also eliminates all harmful substances e.g. Cola remainders, which will slowly but surely corrode the thin conductive strips of the Board and the chips connection legs, thereby destroying the PCB. You can order our Games with the option Washed, as well as send us your own PCB for cleaning. The price is 14,90 € per Board, if you have to clean larger quantities then please request our offer.